Prambanan Temple Compounds consist of Prambanan Temple (also called Loro Jonggrang), Sewu Temple, Bubrah Temple and Lumbung Temple. 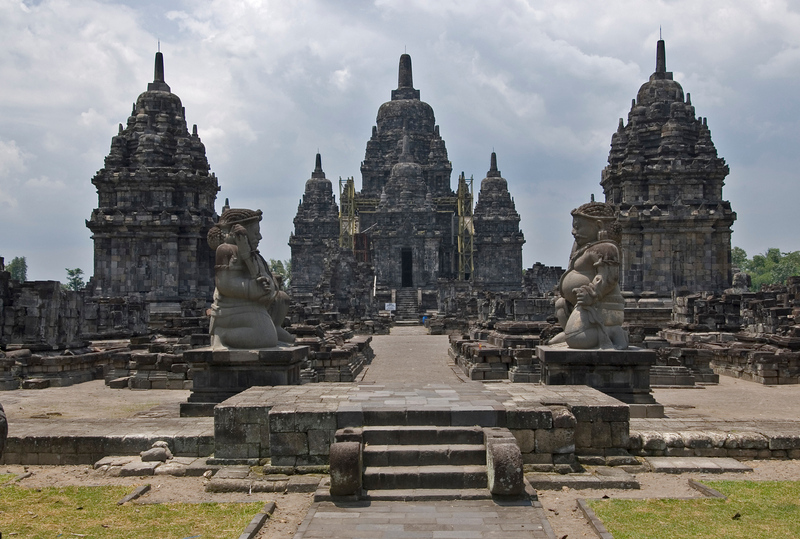 Prambanan Temple itself is a complex consisting of 240 temples. All the mentioned temples from the Prambanan Archaeological Park and were built during the heyday of Sailendra’s powerful dynasty in Java in the 8th century AD. These compounds are located on the border between the two provinces of Yogyakarta and Central Java on Java Island. While Loro Jonggrang, dating from the 9th century, is a brilliant example of Hindu religious bas-reliefs, Sewu, with its four pairs of Dwarapala giant statues, is Indonesia’s largest Buddhist complex including the temples of Lumbung, Bubrah and Asu (Gana temple). The Hindu temples are decorated with reliefs illustrating the Indonesian version of the Ramayana epic which are masterpieces of stone carvings. These are surrounded by hundreds of shrines that have been arranged in three parts showing high levels of stone building technology and architecture from the 8th century AD in Java. With over 500 temples, Prambanan Temple Compounds represents not only an architectural and cultural treasure but also a standing proof of past religious peaceful cohabitation. The Prambanan Temple Compounds are very similar in architectural style to the early Hindu temples you can see in Angkor, Cambodia or My Son, Vietnam. While it is often overshadowed by nearby Borobudur, it is in many respects much more impressive. Unfortunately, an earthquake in 2006 did significant damage to the entire complex. Restoration efforts are underway, but it was pretty obvious that major damage was done to the site. Prambanan is even closer to the center of Yogyakarta than Borobudur and should be included in any visit to the city. There is also an opera which takes place in the evening at Prambanan which uses the ruins as a backdrop. I didn’t get to attend, but it looked pretty cool. It is possible (but probably not advisable) to fly to Yogyakarta and visit both Prambanan and Borobudur from Bali and return in one day. Taking a day or two is a good idea and well worth the effort. 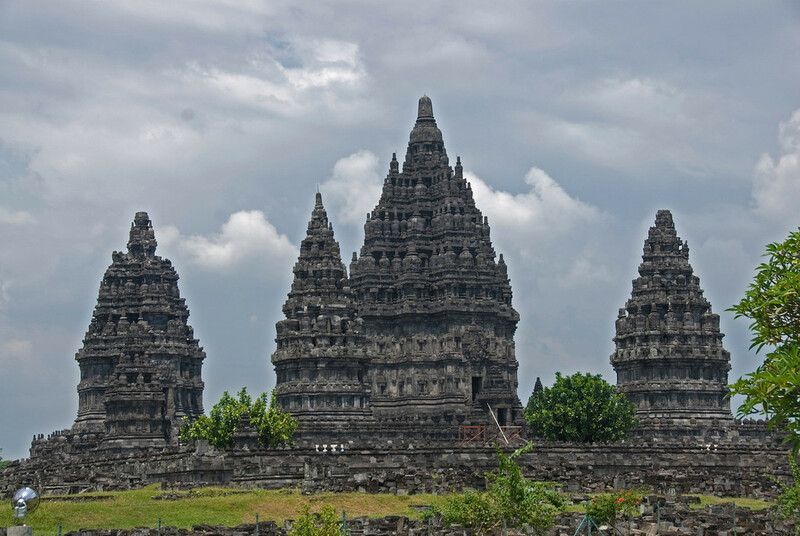 The Prambanan Temple Compounds was built in the 10th century. This temple compound is considered as the most beautiful Hindu temple in the world. The Prambanan Temple is located close to another famous temple in Indonesia (a Buddhist one), Borobodur Temple Compounds. This temple complex in Java consists of three main temples. Each of these temples is dedicated to the three great Hindu divinities: Shiva, Vishnu, and Brahma. The biggest of the three temples is dedicated to Shiva, which measures at 47 meters in height. The temple compound was inscribed as a UNESCO World Heritage Site in 1991 for its cultural value. 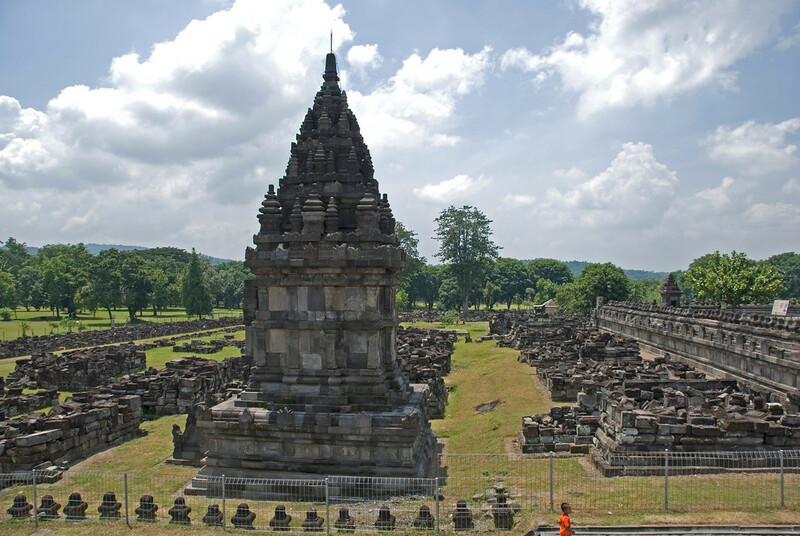 It is also the largest Hindu temple in Indonesia, and one of Asia’s biggest. The architecture of the temples is classified by the use of tall and pointed details, which is common in Hindu type architecture. The temple attracts several visitors all year round. The closest cities to travel to Prambanan are Semarang and Yogyakarta. Hence, you can choose any of these two as jump-off points to get to Prambanan Temple Compounds. There are a number of airlines that fly to Yogyakarta from Jakarta or other cities in Indonesia. You can rent a car to drive to Klaten. From Klaten, you can simply walk to the temple. Another option is to hire a Becak driver who will take you to the entrance gate of the temple. 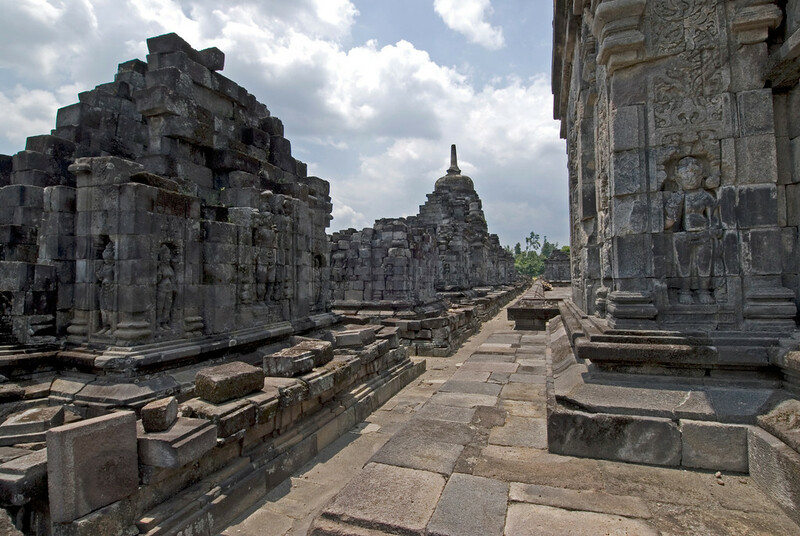 If you are visiting the Prambanan Temple Compounds, the best way to explore it will be on foot. This will allow you to witness the detailed architecture and the landscape surrounding the temples. However, the temple covers over 39 hectares in land area. You should be prepared with comfortable clothes and shoes if you plan on exploring the temples on foot. The main yard is where you will find the three main temples. There are also 13 other smaller temples within this part of the compound. The second yard, meanwhile, consists of 200 more temples. 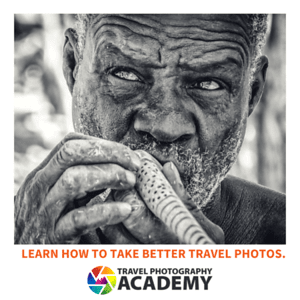 You should be prepared to get busy sight-seeing and taking photographs of the temples. Unlike the temples of Angkor Wat in Cambodia, the temples in Prambanan are located closer to each other and are therefore easier to explore. Plus, the area surrounding the park is landscaped and developed. The base of the temple is known as Bhurloka, which consists of a large space marked by a rectangular wall. It represents the unholy area in Hindu belief. The central part is the Bhuvarloka. It represents the central part of the complex or the ‘middle world’ in Hindu belief. This is where the worldly possessions are left behind as the pilgrims continue on their quest to find the light of truth. Finally, the Svarloka is the top part of the temple and represents the realm of the gods. This is the holiest zone in the temple. The discovery of the Prambanan Temple Compounds took place in 1811. A surveyor stumbled upon the ruins by chance. After that, it was abandoned and nothing was done to restore it until the locals used the foundation stones and many looters took the relief from the temples as construction material or for decorations in their own home. Hence, a restoration project was initiated in 1930. To this day, there are still restoration projects ongoing at the temple. My wife and I visited here and Borobodur but on different days last September! In one day you wouldn't really have the time to appreciate. BTW I flew here to you site via Twitter. Hope you continue to have a great trip! Beautiful. it doesss remind me of angkor wat. Wow, thaks for the tip! If it’s really that uncrowded I’d love to see it. If/when you come to Iceland …. send me an e-mail. It’s expencive – but you’ll love it. Yes, reminds me of the temples in Angkor of Siem Reap. Southeast Asian countries share a lot in common.